…Meticulously crafted stories marked by wit, emotion, memory, and lost grandeur. The eleven short stories in this prize-winning collection pivot on life’s ambiguities and the central question they pose in Tabucchi’s fiction: is it choice, fate, accident, or even, occasionally, a kind of magic that plays the decisive role in the protagonists’ lives? 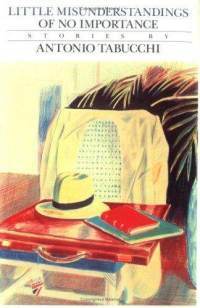 Blended with the author’s wonderfully intelligent imagination is his compassionate perception of elemental aspects of the human experience, be it grief as in “Waiting for Winter,” about the widow of a nation’s literary lion, or madcap adventure as in “The Riddle,” about a mysterious lady and a trip in Proust’s Bugatti Royale.